I listen to my Reba McEntire station on Pandora everyday to and from work. Have since I was a little girl. I’m not ashamed of her so don’t say anything bad about her, or I will stab you. If you aren’t familiar with Pandora it’s the most amazing “radio” app ever. You pick a person/song/genre and it does the rest. Giving you songs that are like what you entered. You give songs the thumbs up or thumbs down and it figures out what to play from there. ANYWAY for the part I am ashamed of. 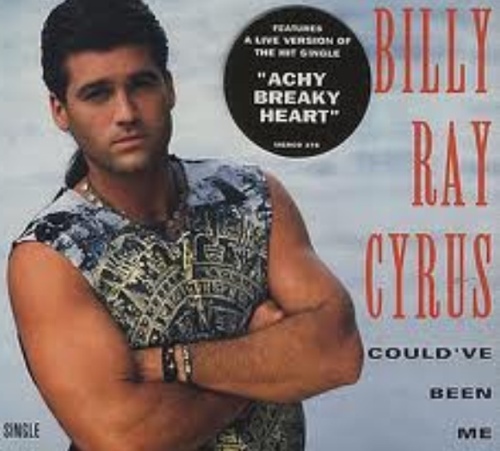 One of my suggested songs is called “Could’ve been me” by that annoying little twit Miley’s daddy. Yup, that would be Billy Ray Cyrus. Mr. Achy Breaky Heart himself. It’s a great song and I LOVE LOVE it. I know those of you who know me in the flesh are embarrassed for me.